The most beautiful and romantic of instruments, the harp adds a unique accompaniment to that special occasion. Perfect for weddings, cocktail parties, corporate hospitality and other exclusive events, it will enchant guests with it's melodious, lilting sound, whilst remaining soft and unobtrusive. The most beautiful and romantic of instruments, the harp adds a unique accompaniment to that special occasion. Perfect for weddings, cocktail parties, corporate hospitality and other exclusive events, it will enchant guests with it’s melodious, lilting sound, whilst remaining soft and unobtrusive. Ornate and portable, the harp is a delightful alternative to more traditional forms of background music. The harp is a versatile instrument and lends itself well to most musical genres. Kate’s extensive repertoire spans light jazz, baroque and classical, folk, show tunes and popular hits. She offers a professional and bespoke service to suit your needs. Kate studied at the Royal Scottish Academy and Trinity College, London. She frequently gives recitals as a soloist, with chamber groups around Britain and has performed at the Royal Festival Hall, Barbican Centre, St John’s Smith Square and Southwark Cathedral. She performs with a variety of orchestras, including the BBC Symphony Orchestra, Scottish Sinfonia and the National Musicians’ Symphony Orchestra. Kate also plays in the Aurora Duo, a flute and harp ensemble, who recently performed Mozart’s Flute and Harp Concerto at the Royal Naval Chapel, Greenwich. In addition to her solo and orchestral experience, Kate performs at hotels such as the Langham Hilton, Sheraton Park Tower, Eltham Palace, The Landmark, The Savoy, Somerset House, Balmoral Hotel in Edinburgh and Glamis Castle. 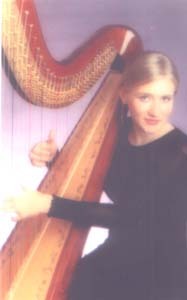 She recently returned from a trip to Lapland, where she was resident harpist. Kate has also appeared on Scottish television and performed for Royalty and Members of Parliament. Kate regularly performs for all types of event, from weddings to cocktail parties, both corporate and private.